La Liga says that the functionality requires the user’s express consent and that it is only intended to detect unauthorized broadcasts of soccer games. The organization behind Spain’s top-flight soccer league known as La Liga has added a functionality to its official Android app that enables it to identify bars, restaurants and other public venues that broadcast soccer games illegally, according to the Spanish daily El Diario. It has turned out that, after being downloaded or updated, the app asks the user for permission to access their smartphone’s microphone and geolocation service (GPS). This, in and of itself, isn’t that unusual. The devil is in the detail, however. 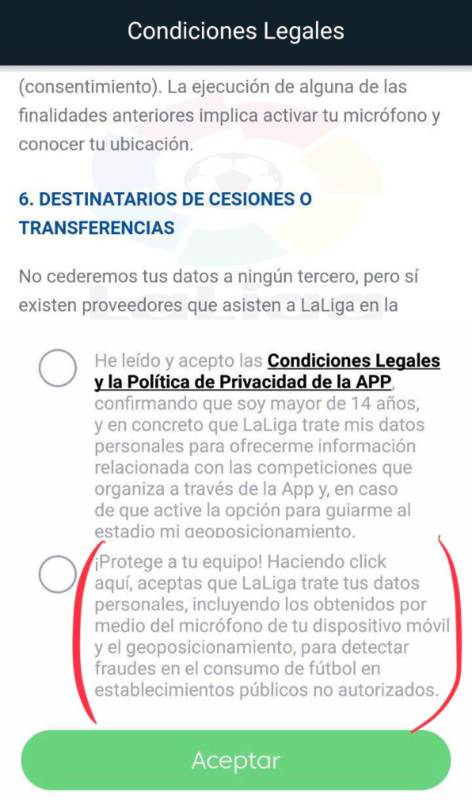 If the user grants their permission, La Liga receives the ability to activate remotely the phone’s microphone in order to record audio clips of the handset’s surroundings. In doing so, the app seeks to ascertain if the captured sound corresponds to that of the broadcast of a soccer game. At the same time, by turning on the phone’s geolocation service it can pinpoint the location of the place where the recording was made and, thus, identify the establishment that may be showing the game without a license. In fact, users signing up for the app are presented with two tick boxes. By checking the first one, users confirm that they have read the app’s terms and conditions. Meanwhile, the second box asks the users to agree to the app’s use of data obtained courtesy of its access to the handsets’ mic and GPS functionalities with the aim of detecting illegal broadcasts of soccer games. Checking the second tick box – which begins with the exhortation “protect your team!” – isn’t actually required to use the app. What did La Liga say? 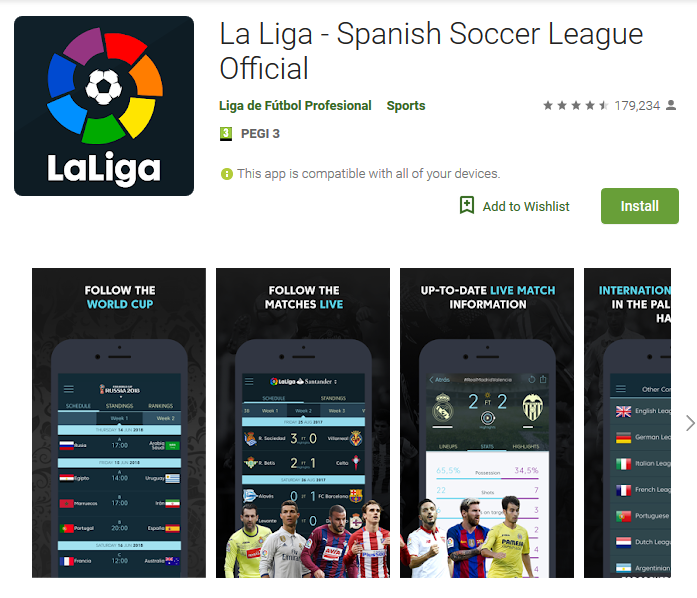 La Liga’s governing body, LFP, said in its statement on Monday that the functionality was added to its Android app only in the June 8 update with the sole aim of cracking down on unauthorized broadcasts of soccer games within Spain. La Liga says that unlicensed broadcasts of soccer games in bars and restaurants cost Spanish soccer €150 million (US$176 million) in lost revenues each year. LFP also stressed that the functionality is subject to the user’s express approval and that it can be turned on only during the league’s matches. Additionally, it said the app will remind the users of the functionality on a regular basis and ask for confirming their consent. In an effort to further ease privacy concerns, La Liga said that it doesn’t access the captured audio snippet, as the snippet is instead automatically converted into a binary code on the device itself. The code is then compared to a reference database and, if there’s no match between the two, the former code is discarded. The organization stressed that there is no way to turn the code back into the actual content of the recording. Regardless, the tactic has prompted a probe from AEPD, Spain’s data protection watchdog. The 2017-18 La Liga season actually concluded in May and the new one doesn’t kick off until August. The app – which has accumulated more than 10 million downloads from Google Play – has now set its sights on the FIFA World Cup. “In this version you can enjoy the Russia 2018 World Cup. Do not miss any details with the Official App,” reads the app’s “What’s new” section. Online threats that may lie in wait for you (not only) around the upcoming soccer extravaganza are described in a special series of our articles.